Hayes Pump distributes the vast selection of John Crane mechanical seals. The range of seals available includes high performance, low emission petroleum seals, vessel and agitator seals, heavy-duty slurry seals and a variety of elastomer, formed and metal bellows seals suited to numerous applications. Hayes Pump is a factory-trained, stocking distributor for John Crane and provides local support and inventory. John Crane has a strong legacy that dates back to the creation of the Crane Packing Company in 1917. Innovators from the start, John Crane designed the world’s first automotive mechanical seal in 1949. The groundbreaking design was soon followed by the development and introduction of the John Crane Type 1, end-face, elastomer bellows shaft seal. This patented product revolutionized sealing technology and is still one of the most widely used seals in the industry. Today, they are part of Smiths Group. Hayes Pump offers John Crane in Maine, Massachusetts, Vermont, New Hampshire, Rhode Island, Connecticut, New Jersey, Greater New York City Metro and Eastern New York State. Hayes Pump carries the widest selection of seals in the market. We have the right solution for virtually any application. We will deliver unequaled performance, reduced installation times and lower maintenance costs. Rapid shipments are available from our stocked warehouse. Oil & Gas, Power Generation, Chemical, Pharmaceutical, Mining & Minerals, Food & Beverage, Pulp & Paper Processing, Refrigeration Compression, Water & Wastewater. Dry Gas Mechanical Seals are non-contacting, dry-running mechanical seals and are designed to not contaminate a process. These seals are optimal for harsh working environment such as oil exploration, extraction and refining, petrochemical industries, gas transmission and chemical processing. 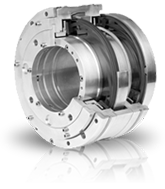 Metal Bellows Mechanical Seals allow for higher flow rates and less clogging than traditional spring seals. Bellows technology creates a uniform outside wall for uniform movement under hydraulic pressure. These seals are known for their reliability, tight tolerances, and compatibility with harsh media in pump systems. PTFE Bellows Mechanical Seals are engineered for maximum reliability in extremely corrosive applications such as high concentrations of acids, salts, strong oxidizing and reducing agents and chemically active organic compounds. Split Mechanical Seals use the latest modular split seal technology from John Crane. This combines the unique design requirements for wet-running and dry-running services onto one common seal platform. Elastomer Bellows Mechanical Seals are widely recognized as the industry’s workhorse and suitable for a wide range of service conditions ranging from water and steam to chemicals and corrosive materials. Non-contacting, Gas lubricated Mechanical Seals have extremely durable seal design provide very low cost of operation and ownership. PTFE Wedge Mechanical Seals are used on corrosive applications, typically for chemical or hydrocarbon processing. Choices range from graphite-based wedges for corrosion resistance or high-temperature applications to DIN seals for general, low, medium and high pressure duties. Alternative seat designs options are available to suit product and operating conditions of applications. Vessel and Agitator Mechanical Seals range from single Dry-running Mixer and Agitator Seals suitable for explosive atmospheres to Modular, high-performance, Agitator seals for glass-lined vessels. John Crane’s DIN vessel seal family has been specifically designed to suit all DIN vessel and agitator applications for the chemical and pharmaceutical industries. Labyrinth Mechanical Seals are known for their long life and lack of friction to help prevent leakage. Many gas turbine engines, having high rotational speeds, and pistons use them to store oil and seal against high pressure. O-Ring Pusher Mechanical Seals range from single cartridge pusher seals designed to help prevent emissions leakage in most refinery applications. Additional high-performance, low-emission cartridge seals designed to provide additional safety for hazardous to the Type 8B1 design which has been the preferred choice for safe, reliable, un-pressurized tandem and pressurized dual seal arrangements in petroleum services for more than four decades. Slurry Mechanical Seals are designed to operate in the harshest abrasive slurry environments. These seals have unique design features allowing seal to operate without a flush, reducing total cost of ownership. +Reduce Methane Gas Emissions with a new Seal? Can’t Find Something? Ask Us.